Ophira Eisenberg hosts a combination of brainteasers, pub trivia, comedy, and music Saturdays at 10 am. 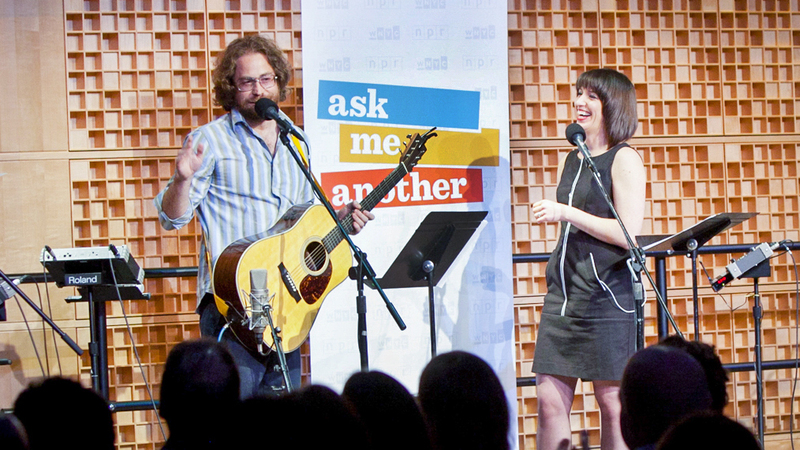 'Ask Me Another' house musician Jonathon Coulton and host Ophira Eisenberg. Ask Me Another brings the lively spirit and healthy competition of your favorite trivia night right to your ears. With a rotating cast of funny people, puzzle writers, and guest VIPs (Very Important Puzzlers), it features the wit of host Ophira Eisenberg, the music of house musician Jonathan Coulton, and rambunctious trivia games, all played in front of a live audience. Tune in Saturdays at 10 am on Q-90.1 FM.